Going more than 3 miles? Try our new sedan service! Check out A County Sedan for more information. Meet the new County Cab! 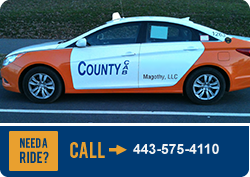 With a fleet of more than 50 late model taxicabs at your disposal, County Cab is changing the face of Baltimore County taxi service. We provide real-time tracking and billing and offer the convenience of gift coupons, Baltimore Taxi Fare Card, corporate charge accounts and event support. We use the latest available technology and the safest, most comfortable vehicles to provide passengers with the highest quality of cab service. Insist on a County Cab and get the service you deserve!